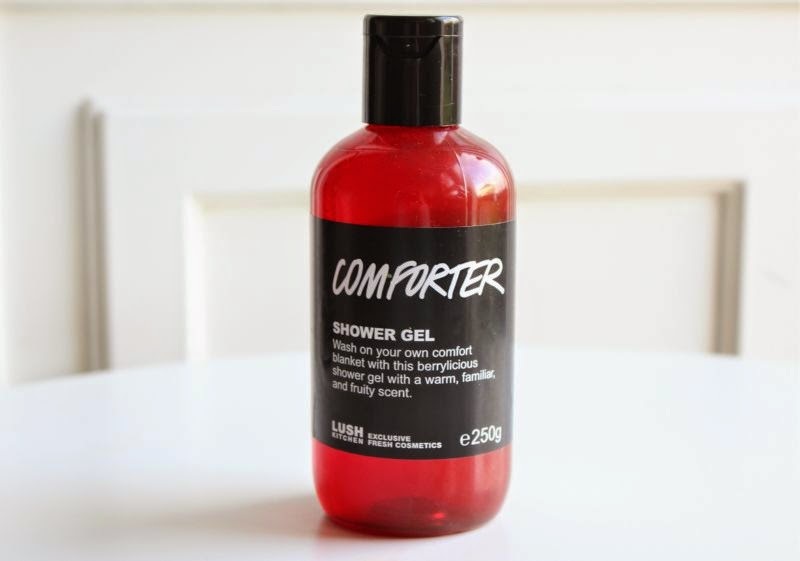 Last week it was announced on Twitter and other social media outlets that the Lush Kitchen would be releasing a batch of The Comforter Shower Gel along with solid and mist of fragrances. As much as I adore the scent of The Comforter the only product that appealed to me was the shower gel, yes at over £10 for a 250g bottle it was pricey but sometimes you just need to treat yo' self. "Sometimes you just need to shut yourself off from the outside world under a blanket of fruity foam that will put you back in the right frame of mind to face the world. Cassis absolute gives a distinctive blackcurrant fragrance, while bergamot adds an uplifting note." Usually Lush The Comforter is presented as a bubble bar which is great if you own a bath tub, not so much if like me you only have a shower. Think of all those bathing opportunities I've missed out on or maybe not as that is a pretty graphic image. Most Lush fans will be able to identify the scent of The Comforter from ten paces - it is somewhat of an iconic Lush product in my eyes. A bright berry scent that is both sweet and comforting, hence the name! Sometimes certain fragrances don't translate well into showering products but luckily for me this is not one of them, if anything I'd say I actually prefer this as a shower gel opposed to a bath treat. As with all Lush shower gels it cleanses well, doesn't strip my skin and did I mention it smells phenomenal? Oh I did. As far as I know this was a one off Lush Kitchen exclusive but I guess it doesn't hurt to keep an eye on both websites to see if it sneaks back online at some point? Fingers crossed. Wow Id love to try this, hope they have it in my nearest LUSH! So stoked for this range! I have 2 backups of this haha! Love the Comforter scent so much, hope they make it permanent asap. Got myself the perfume as well - I feel very lucky! Sounds lovely! but over £10 for 250g?? That's crazy! Radox shower gels are gorgeous and only a £1 for the same amount! Think I'll be sticking to those. Oh good lord I need this! I wish there was a LUSH near me!